Yes, you read it right there are some domain name extensions e.g. 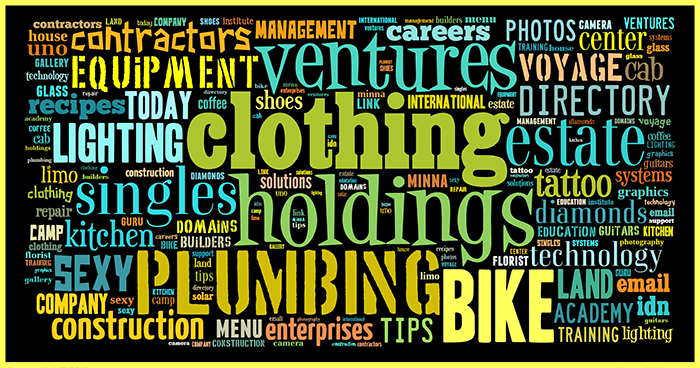 .guru .clothing .holdings .ventures .singles .bike .plumbing starting today but the registration is way too high to consider. I've tested it through NeedName.com website, see the captured image trying to register "anykeyword.guru" domain name. The price tag starts at US$11,000 continue reading to understand the pricing implemented by the registry. The most common gTLD (Generic Top Level Domains) are listed below. and country codes .US .CA .DE etc. This first group of new TLDs (and any TLDs from the Donuts Registry) will work a little bit differently. Here’s what you need to know before they hit the street with some key dates. The Donuts Early Access Program (EAP) Donuts kicks off GA for their TLDs with an Early Access Program (EAP). EAP is similar to a Landrush phase where a premium price is paid to claim the best domain names. Anyone interested in registering names during EAP can place their orders on a first-come, first-served, non-restricted basis--at a set premium price (determined by the registry). On the first day EAP goes live the price starts out at $11,000 and then drops each day down to a standard registration rate starting on Feb. 5th 2014. EAP is the perfect opportunity to register highly desirable, non-trademarked names. You can grab names to promote or protect your business. Even dominate a market by registering industry-related terms (before someone else beats you to it). Standard General Availability (GA) The Standard GA date is an important date to remember--these first 7 new domains will be available to consumers at a standard registration price. Pre-registration closes so we can automatically try registering any domain names with pre-registration orders. Typically within just seconds of go live. If we are unable to secure the domain name, we’ll refund the order. Any domain names with multiple pre-registration orders will go through an auction process at NameJet, our auction house partner. Make sure you place your pre-registration orders now to get the names you want, below are key dates for new domains going live in February.